The $300 million campus is designed to encourage employees to walk between buildings, spend time in the fresh air and collaborate with co-workers from other departments, said Kirk Hotelling, American Airlines managing director of campus and airport affairs. It turns out that the new campus, while technically in the city limits (enough so to qualify for tax abatements offered by Fort Worth), is actually almost 20 miles east of its downtown, just southwest of the Dallas-Fort Worth Airport, on a 300 acre property bounded, as the newspaper reports, by freeways and highways on all four sides. In our experience, big properties far from city centers are seldom very walkable. Does that hold for this development? Our go to measure of a place’s walkability is Walkscore.com. 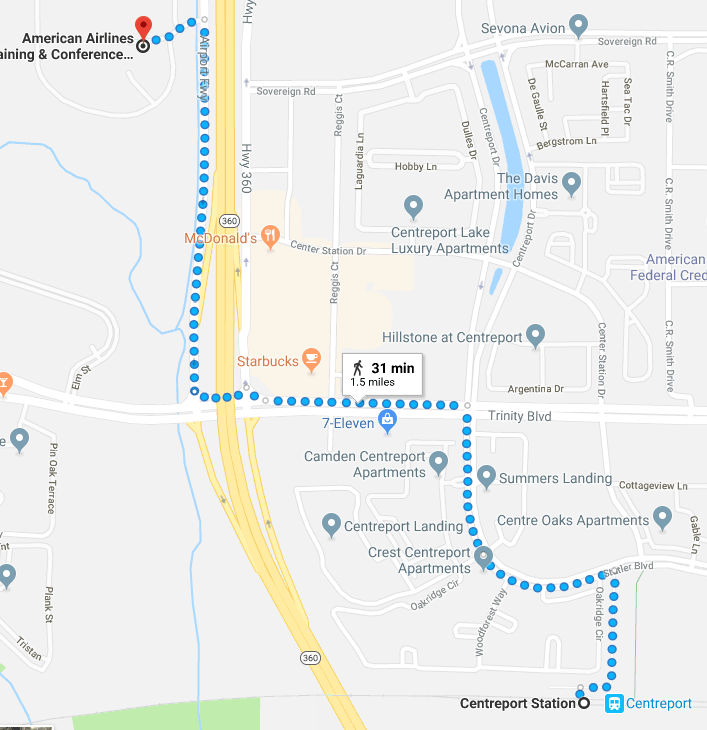 A quick look at their website shows that the American Airlines headquarters is highly car dependent, and that while the campus itself may turn out to be walkable, there’s almost nothing around it that one could easily walk to. 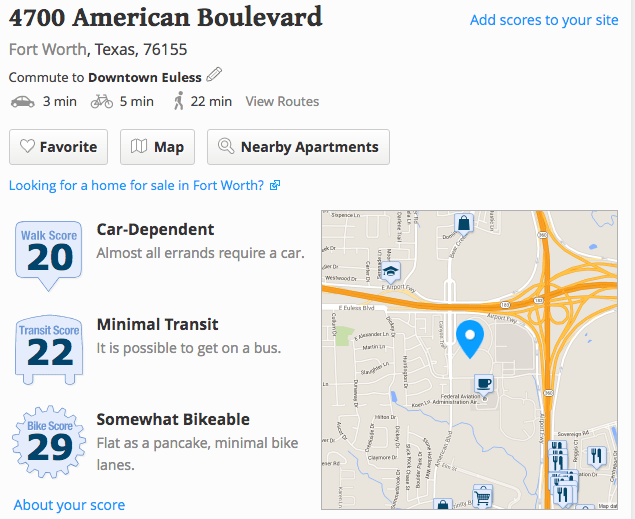 The site has a Walk Score of 20, which translates to “car-dependent” meaning that almost all errands require a car. If you work at the new American Airlines headquarters, you’re almost certainly going to commute by car, and if you need to do some simple errand–get a haircut, pick up dry cleaning, have a cup of coffee with a friend–you’re almost certain to need your car to do it. To the extent this is “walkable” it is purely in a controlled, corporate sense of the word–you can walk from one office or meeting to another; but if both of your trip-ends don’t happen to involve American Airlines business, you’ll be hard put to walk at all. 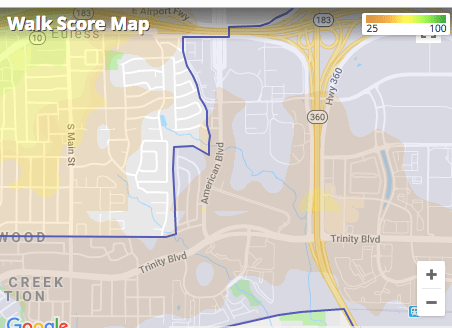 Walkscore’s heat map of the area shows that there’s very little walkability in this region, largely due to the paucity of possible destinations and the formidable barriers posed by the adjacent 360 freeway and other arterials. If it had wanted to choose a walkable location, in contrast, it could have looked at downtown Fort Worth, much of which scores as highly walkable. 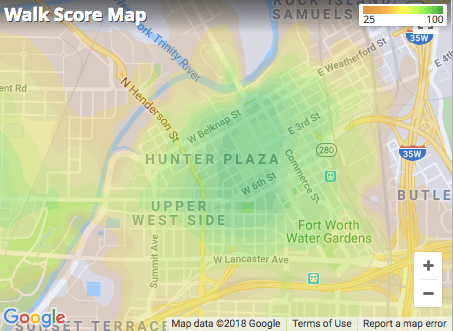 Here’s the same heat map for downtown Fort Worth. Sure, there are plenty of parking spaces (more than 10,000 of them) in garages on the perimeter of the property. But they are meant to be places where employees and guests can park their vehicles and forget about them until their day at the headquarters is done. There’s no word on whether American Airlines plans to charge its employees for parking in these garages (cynical air travelers will no doubt assume that anyone who can charge $25 for a carry-on bag will have no compunction about charging for parking, but that would be out of character with most suburban developments). As we’ve noted before, free parking is a powerful inducement to car travel, and its apparent that with 10,000 parking spaces, American Airlines thinks that nearly all of its employees will drive alone to work. You’d think that with 12,000 people working in a single location, that a development like this would be a great candidate to be served by transit. After all, most workers will be working in seven story buildings. But in addition to having enough parking so that almost everyone can drive alone to work, transit in this area is extremely thin. In theory, the site is connected to the TRE commuter rail line that runs between Dallas and Fort Worth. That line stops at the Centreport Station, about 1.5 miles (and across the 360 freeway) from the campus location. According to Google it’s about a 30 minute walk from the station to the campus location. There’s a peak hour shuttle that runs between 6 and 8 a.m. and 3 and 6 p.m. on weekdays, taking about 8 to 12 minutes to travel between the rail station and the campus. Finally: did I mention that there will be bicycles? Yes, 100 of them. It seems like an impressive number but its works out to fewer than 1 for every 100 employees. As the Walk Score data indicates, this isn’t a very bikeable location, and with 10,000 cars going in and out of the campuses garages, it’s unlikely to be a great place to be a cyclist. Here’s the bottom line: no matter how much your press release talks about miles of trails, or even a hundred bikes, if you build your new 12,000 person headquarters in a distant suburban greenfield, with hardly any transit or mixed land uses nearby, walled off from neighbors by freeways or major arterials, and plan for nearly one parking space for every employee, you’ve done almost nothing to create a walkable environment. Apparently American Airlines thinks that the new site plan will appeal to a younger generation of workers who wants more authentic walkability. Maybe, but only if their definition of walkability is walking to or from their car or between office buildings on the company website. People who want to walk, cycle or take transit from their homes to their workplaces will find it extremely difficult to realize that vision. Hat tip to the estimable Jeff Wood for flagging this story at The Overhead Wire.